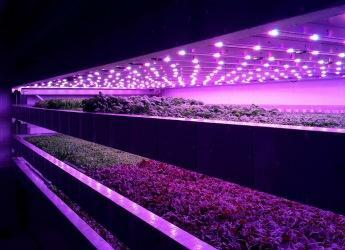 "This initiative combines our world-leading knowledge of plant science at the James Hutton Institute and IGS’ entrepreneurship to develop efficient ways of growing plants on a small footprint with low energy and water input"
Intelligent Growth Solutions (IGS), the Scottish-based vertical farming business, is set to complete the construction of its first indoor growth facility in the next few months. The purpose-built facility is being constructed at the James Hutton Institute's site in Invergowrie, near Dundee. Omron is recognised globally as a leader in the automation and control systems market, and is also well known for its very strong presence in the medical equipment sector. The business is credited with inventing many disruptive everyday systems used globally. For example, Omron developed the first automated traffic signal in the world, the basis of today's magnetic card systems and through collaborations introduced the digital blood pressure monitor and digital thermometer. An Omron Mobile Robot - LD Series Autonomous Intelligent Vehicle – will also be present at the Royal Highland Show to demonstrate how this technology and increased automation will bring vertical farming to commercial reality. For more information please contact Kate Forster of Forward Communications (07787 534999) or Bernardo Rodriguez-Salcedo, Media and External Relations Co-ordinator, James Hutton Institute (07791 193918).